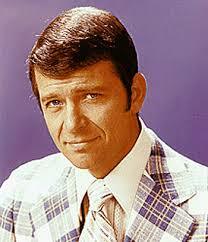 Here's the story of a lovely actor, Robert Reed, who was born today, October 19, in 1932, in Highland Park, Illinois. He is best known as the father Mike Brady, opposite Florence Henderson's Carol Brady, on The Brady Bunch, which aired from 1969 to 1974. He reprised the role of Mike Brady in several later reunion programs. Reed in 1961 with E.G. Marshall in The Defenders. 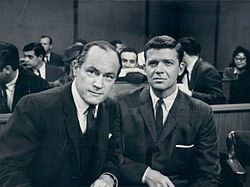 In 1961, Reed landed his first television starring role in The Defenders alongside E. G. Marshall, with the two playing a father-and-son team of defense attorneys. Marshall was also one of the founding members of the Actors Studio in New York; around this time, Reed himself became a member of the Studio, of which he would remain a member for the next 30 years. The Defenders was a hit with audiences and earned a total of 22 Primetime Emmy Award nominations (E.G. Marshall won two Emmys for his performance while the show won twice for Outstanding Drama Series). While appearing on The Defenders in 1964, Reed made his Broadway stage debut as Paul Bratter in Neil Simon's Barefoot in the Park, replacing Robert Redford. This led to Reed getting his role in The Brady Bunch. Reed was the producers' second choice for the role of Mike Brady, after Gene Hackman was rejected because he was too unfamiliar at the time. Despite earning poor reviews from critics and never cracking the Top 30 during its five-season run, The Brady Bunch remained an audience favorite of the 1970s. Since its cancellation in 1974, the series has led a healthy afterlife in syndication and spawned several spin-off series and two television reunion movies. From the sitcom's debut in September 1969, Reed was unhappy with his role as Mike Brady. He felt that acting in the often silly sitcom was beneath his serious Shakespearean training. Producers and directors found Reed difficult to work with both on and off the set. Despite his discontent with the show, Reed genuinely liked his co-stars and was a father figure to the younger cast members. After the end of The Brady Bunch in 1974, Reed won critical acclaim for his portrayal of Pat Caddison, a doctor who comes out as transgender, in a two-part episode of the television drama Medical Center in 1975. The episode also earned him a Primetime Emmy Award nomination. Reed also appeared in the television film Boy in the Plastic Bubble, the miniseries Rich Man, Poor Man, and the miniseries Roots. Reed was again nominated for an Emmy Award for his work in Rich Man, Poor Man and Roots. Reed was bisexual but kept this fact private, fearing it would damage his career. In July 1954, Reed married fellow Northwestern student Marilyn Rosenberger. The couple had one daughter, Karen, before divorcing in 1959. In November 1991, Reed was diagnosed with colon cancer. When he became ill, he allowed only his daughter and a few close friends visit him. Weeks before his death, Reed called Henderson and asked her to inform the rest of The Brady Bunch cast that he was terminally ill. He died on May 12, 1992, at age 59. Reed's death was initially attributed solely to cancer, but details from his death certificate were made public revealing that Reed was HIV positive. While Reed did not have AIDS at the time of his death, his doctor listed his HIV-positive status as a "significant condition[s] that contributed to death" on the death certificate.